Nowadays, plenty of project owners are interested in building their eCommerce businesses from scratch. This article focuses on the main reasons behind the client's willingness to start the online business. In addition, the brief guide how exactly to start the eCommerce is described in the article. In 2017 global e-retail sales reached 2.3 trillion U.S. dollars. Online shopping has become one of the most popular online activities in the world. For instance, India, Indonesia, Mexico, and ChinaAmong are states which belong to the fastest growing online retail markets. Today, the online business is really profitable but highly compatitive as well. 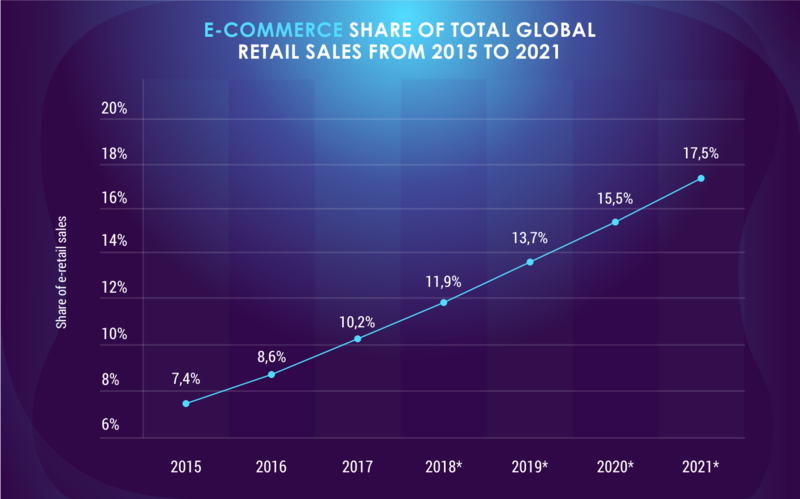 As you can see from the statistic, in 2015 e-retail sales accounted for 7,4% of all retail sales worldwide. This figure is expected to reach 17.5 percent in 2021. 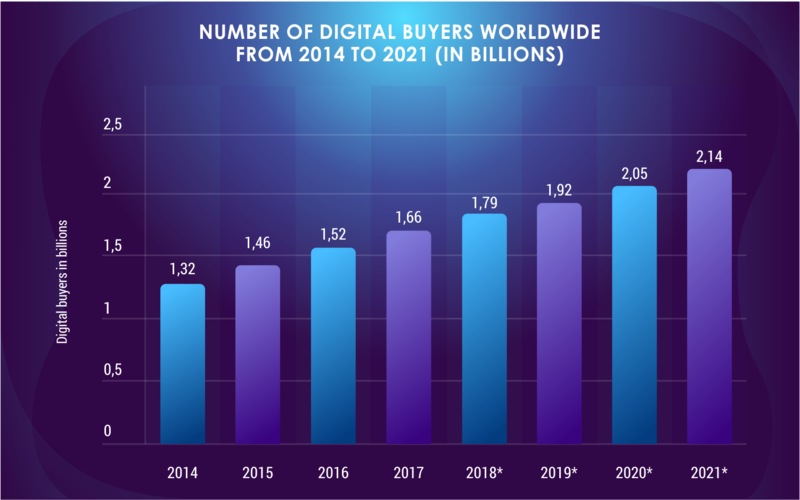 It is suggested that the number of digital buyers will increase and potentially will reach 2,14 billions by 2021. Therefore, the demand on e-retail sales is growing in accordance with growing number of the buyers. Let's move on to the steps for starting your online business. As many businessmen realize developing business from scratch doesn’t start with buying and selling things online. Instead of it it is quite complicated and well research process that take some time. Take a look at the following steps so you could have a clear vision of how to start an online business. At the first stage, it is advisable to choose your niche with definite products or services. Following the model "sell everything for everybody" might not be the best option, because it might be effect the quality of the product (unless you have a massive budget and a lot of time and personnel to create the vide range of different ideas). The beginning business owners in their actions can take an example from successful companies that are working in this area. But remember to invent new features which make your store different! If you don’t find competitors in the chosen area it may indicate an absence of demand in the market. In this case, you should research if somebody needs services or goods you are going to offer. Be careful about starting your business in the very competitive niches: you’ll have to spend a lot of time and money before you manage to keep up with them. It would be better to choose a middle competitive niche and to focus on it. Remember to examine the activities of the top competitors in your niche, read about their pros and cons. Don’t expect to come on top from the very beginning but take every opportunity to grow your customer base and to promote your goods and services. E.g. when you are selling sports clothes you can work together with niches, related to what you do, such as websites with fitness programs, sports clubs etc. There are many business models depending on what you do, develop or sell. Different businesses have specific characteristics and firstly, you should endeavour to find out about them. For example, if you offer any kind of services you’ll do it differently than running product sales. Dropshipping is a good choice if you want to sell products without placing them in your warehouse. The ordered product is shipped from a third party directly to the customer. Another advantage of this model is little investment at the start. Wholesaling is another sale model which has its advantages but requires some place to store goods. White label branding (sometimes called “white labeling”) is a good choice when you’ve got an interesting product idea which can be sold under your brand. Subscriptions let users get access to a product or service for a definite period of time. Having ordered this service once customers get used to it, of course if you offer high-quality goods or services. Besides, you can make money from affiliate marketing - this model allows you to earn a commission from the promotion of other company’s products. You should meet expectations of your consumers or clients with everything you have: brand, website, goods, and image. That’s why knowing who your ideal customers are is crucial. Before you invest in the product, you should use ways to validate the demand. One of these ways is to create an MVP (minimum viable product). The main aim of the MVP is to collect feedback from initial users for making a further strategy. Also read our article: How to create an MVP (Minimum Viable Product): your Step-by-Step Guide. You can also begin with affiliate marketing, e.g. after defining your niche, you create content to send traffic to affiliate products. With its help, you’ll understand whether to create your brand of such goods. Learn as much as possible about your target audience! Test yourself products or services you are going to sell or ask some people to evaluate them (it’s important to realize their pros and cons). Firstly, you should register your company and your business name. You may get legal protections when doing it. Choose your brand name if it’s not the same as your business name. Research the niche, consider some options and choose the most appropriate one. Take into consideration that it’s an advantage when the brand name and the business name are consistent. Get your EIN (Employer Identification Number) to open a business bank account. This number will identify your business. Get permits and business licenses which are needed in your country and your city. Search for right vendors if you offer products or goods. It’s important to decide upon such vendor you are ready to work for a long-term cooperation. Choosing a proper eCommerce software belongs here. Make your logo. Read about creating the right logo and inform yourself what it should include. Decide upon colors representing your brand,fonts etc.in order to create visual image among the consumers. If all the business licenses are ready it’s time to register the domain name. Remember that the design for your business should be compatible with your eCommerce software. So what should you take into account when choosing e-commerce platforms? Consider such parameters like the loading speed, features, compatibility with different payment gateways and with your business structure, your web developer skills, SEO-friendly features etc. Depending on your budget you can either hire professionals to help you or do everything on your own. Each choice has its pros and cons. If you want to build the website from scratch you have to make sure that your developers have already worked with building e-commerce websites. Feel free to ask how long it takes to launch your site. If you want to take the easy way out, choose such a marketplace like Amazon where you won’t have difficulties with taking credit card payments. As in the previous step, you can either choose to hire help or do everything on your own. Your website has to be SEO-friendly to stay competitive in the market.The keywords should be present in URLs, in ads of your website, on each page. But remember if you try to manipulate a page ranking with keyword stuffing,Google and other search engines will penalize your site. Think about how to drive traffic to your website. A lot of elbow grease is required if you can’t invest a lot in online marketing. Top companies invest heavily in their ad campaigns, especially at the beginning. So how to drive traffic to your site? Place videos about your company and create reviews of products or services on Youtube etc. If it is too difficult for you the best option is just to find and to hire help. Having built an eCommerce business is not the end, it’s a beginning and further, you need to promote your company for attracting users and maintaining your current market share. Bear in mind that just starting your у-сommerce business is not a difficult thing, however to beat the competitors will be quite tricky. Create an email list or get phone numbers from users. You can do it when launching a social media campaign or offering some coupons and discounts where the users need to enter an email or a phone number. Then you can send content, interesting offers and many other things to your visitors to keep them interested. Ask them for reviews and respond fast if there are some questions or problems. Track the behaviour of the users on your website. You need to know how and where the traffic flows. It happens from time to time that firstly the website aroused interest but then the users left it in the same place. Find tools which serve as help in monitoring and optimizing the marketing process. Sometimes you should follow the lead of your competitors and take some additional tricks towards them. There are many other ways to promote goods and services, e.g. you offer your products for popular bloggers and they create reviews. It’s important to remember that these bloggers should be in the same niche as you are, for example, you send Makeup and Beauty products to a fashion blogger or children books to the young mom. Sometimes users are offered additional coupons or discounts for placing reviews, inviting new users etc. E-commerce business has become a very competitive sphere and business owners have to do their best to produce the high quality product as well as thoroughly think each and every element of the e-commerce. If you think to build your online business you can do it on your own or with help of skilled developers. If you decide to take the first way we hope that this guide is helpful for you! If you choose the second option make sure you find professionals who have had experience with e-commerce development. Feel free to contact us and remember your ready business is not the finish but the start of an adventure. There are several types of Music apps: Music Streaming apps, Music Player apps, Music Identification apps, Music Download apps, Music Making apps. What are the Major Benefits of eCommerce to Your Business? Here are the advantages of e-commerce: 1) Lower costs for ads, for personnel, for running the business. 2) Detailed product characteristics are offered.